European Review Of Social Psychology Volume 8: 9780471979494 Hardcover - LIMEROCK BOOKS INC.
European Review of Social Psychology Volume 8 Edited by Wolfgang Stroebe Utrecht University, The Netherlands and Miles Hewstone University of Wales, Cardiff, UK The European Review of Social Psychology is an annual series that reflects the dynamism of social psychology in Europe and the attention now paid to European ideas and research. Although open to authors from all nations, one of its major purposes is to further the international exchange of ideas by providing an outlet for substantial accounts of theoretical and empirical work that has not been previously published in English. With the help of an editorial board consisting of senior scholars from various European countries and the USA, the editors invite outstanding researchers to contribute to these volumes. The emphasis of these contributions is on critical assessment of major areas of research and of substantial individual programmes of research as well as on topics and initiatives of contemporary interest and originality. The authors of this eighth volume are drawn from Europe, the United States and Australia, and represent the international scope and quality which are the hallmarks of this series. 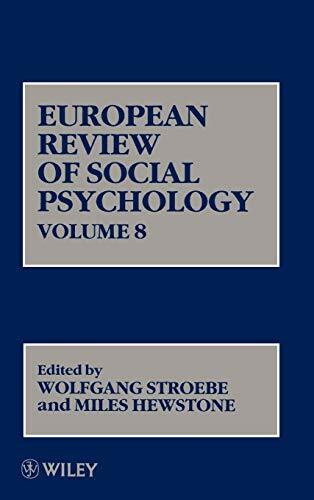 This annual series reflects the dynamism of social psychology in Europe and the attention now being paid to European ideas and research. It stimulates the international exchange of ideas by providing an outlet for substantial accounts of theoretical and empirical work that has not been previously published in English.